The eldest of three sisters, Margaret Brynhild Parker was born in 1907 in Letchworth in Hertfordshire. She was commonly known as Bryn, later in life signing her professional artwork ‘Brynhild Parker’. Bryn grew up in a creative environment; her father’s artist acquaintances were Harold Gillman, who belonged to the Camden Town Group, and fellow member William Ratcliffe. She attended The Slade School of Fine Art from 1925 to 1928, gaining a series of prizes whilst there. 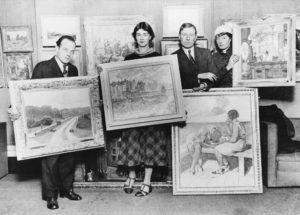 Bryn was invited to exhibit with the East London Group in 1930, having previously exhibited with the members at the Young Painters Society. The East London Group was created by John Cooper, an artist and graduate of The Slade. John taught evening classes at Bow and Bromley Evening Institute in East London. Walter Sickert was also a teacher there and many of the East London Group members were recruited through these classes. The students were aspiring artists who all held day jobs in other professions. Bryn became an artist and illustrator. The East London group became respected in their time with members taking part in group and solo exhibitions which were very well reviewed. Members Elwin Hawthorne & Walter Steggles represented Great Britain at the 1936 Venice Biennale. Somehow the East London Group had mostly been forgotten in the history of modern art in Britain, but their story was recently revived with national exhibitions highlighting their work again. The group exhibited annually for eight years from 1929 at the prestigious Lefevre Galleries in the West End of London with works entering public collections. 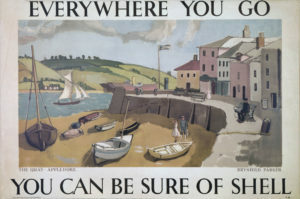 Other artists in the group, Harold and Walter Steggles and Elwin Hawthorne, also created posters for Shell which were printed in 1932, 1934 and 1937. 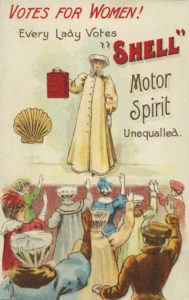 Many of the group members’ works are now held in public collections in Britain and abroad, with Bryn’s Shell poster in the V&A, London and MOMA, New York. Bryn exhibited continuously with the East London group until 1936. She had successful solo exhibitions at the Lefevre gallery in 1935 showing 22 pictures and then 40 works in in 1938. Bryn moved to Antibes in the late 1940s after the death of her mother and aunt, where she moved in different social and artistic circles to many of her East London Group colleagues. This included a vibrant art scene in the Cote d’Azur, France, centred around Pablo Picasso whom she exhibited alongside. Bryn kept in touch with friends and East London Group members such as Ruth Collet (nee Salaman). She returned regularly to the UK for holidays in Cornwall, where she continued to paint. She died in 1987.